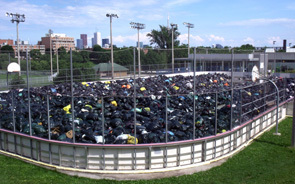 Christie Pits Park, pictured above, was turned into a temporary dump during the 2009 summer garbage strike. On May 17th 2011, Toronto council made an historic decision to contract out garbage collection in the western half of the city. After hours of heated debate, council voted 32-13 in favour of the measure that was long championed by the Toronto Taxpayers Coalition. In the midst of the debate, Toronto Taxpayers Coalition circulated a petition to the mayor and each councillor that contained well over 2,000 signatures in support of the move. What this means to taxpayers is savings of about $11-million annually over the next eight years. However, it also means there is another $11-million in savings on the table to be found in the eastern-half of the City. The Coalition first raised the issue at budget deputations in January 2011, telling a subcommittee to explore the best way to utilize managed competition to realize maximum savings. “Find the best way to contract out garbage, and then implement it,” our spokesman told the mayor and thirteen councillors attending public consultation in North York. At the time, only Etobicoke had private garbage collection. “They did it because it saved money,” our spokesman added. Toronto Taxpayers Coalition convinced Council to endorse our petition. It took the new contractor a couple weeks to “work out the kinks”, but the results speak for themselves. Not only were savings found, but complaints were down and customer satisfaction was up. This move was historic for the city. Its success will be looked back upon as a precedent for providing better service for less cost by private-sector contractors. That said, the fight is just getting started. Despite all the evidence, there is very little political will to take the step to contract out garbage collection east of Yonge St. We must step up our fight to ensure further savings are not squandered by politicians who believe government does everything better. Emailing your friends and family. Tell them to sign our petition and to email their friends!